Explain to me how you balanced your music during law school. It required a lot of hard work. I often briefed my cases on the plane. Law school is not necessarily hard in terms of the content. It is the voluminous amount of material that you have to manage in a very limited amount of time. I had to become better at time management. Whatever time I had, I had to use it wisely. I also slept very little. Is it possible for the bhangra scene to evolve in the US as it has in the UK? Actually, it is evolving slowly. There are a few artists in the US making bhangra. Unlike the UK, there is a lack of geographical proximity to other artists and musicians in the US, which makes it difficult for artists to pursue music. It will change slowly, as more artists start to make music. What are your thoughts on the state of the stale UK bhangra scene? Artists in the UK need to experiment more. Everything that has been coming out recently is sounding the same. For some artists it may be important to make wedding music to get wedding bookings, but artists should make music for the art of it too. We need more artists who are not afraid to take a chance. Tell us what it’s like working with the Das Racist gang? It was a lot of fun! We had a great time recording “Punjabi Song”, together. They are fun guys to hang out with! So when are you going to quit your day job? Which one? I try to devote equal time to both, law practice & music. I have my own practice, so there is flexibility of time. I enjoy doing both. I will continue both for as long as I can. What’s your go-to bhangra dance move? I am really not much of a dancer. I usually go for the standard “arms up, screw the light bulb” style move! What are some of the projects you’re currently working on? I just finished album, “BIK I AM,” released on Soldier Sound Records, ltd in the UK, Inar Records ( my label) in America and Sony BMG in India. Aside from that, I am working on bunch of collaborations, including partnering with Beatwala. I’m also working with some amazing new producers from the UK, “Atik Middleman”Rehman, Nav Sarao, Bellringer, and others. Which artists do you have your eye on right now? Who do you think will blow up in the next five years? I do think that Shide Boss has a great voice. I am not a big fan of his rapping, but I think he can sing. 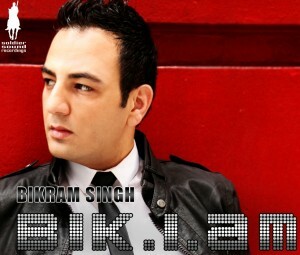 This entry was posted in Arts and Entertainment, Music and tagged Bhangra, Bikram Singh, Punjabi music by Phillygrrl. Bookmark the permalink. Very nice. But there is a new issue which may not affect desis in US as from what I have seen in Sepiamutiny over the years, America is heavy with those south or east of Punjab. In the UK it is Punjabi heavy. However the direction Bhangra has taken is finally beginning to alienate the actual punjabi speaking population from whence it comes. It is more hip hop and English based with singers remixing because being from west they can speak but can’t read or write the language so are limited and lazy. The swing is towards Hindi music or Urdu, not because they hate the language of punjabi, but hate the filth the new artists are producing. Slowly some clever British Punjabis are learning to read and write the language and entering the field of literature and giving back more than dumb music. Just look at what Roop Dhillon has achieved. That said to study law and at the same time become successful at Bhangra is an amazing feat and his success is well deserved. In my view there is a superior singer on the way called Rana Bolla from Derby,UK. Watch this space! Nice post providing good information.